I am interested in mapping the pre-war (WWII) border between Poland and Germany. Is there any data available in a public resource? Can anyone describe waypoints along the border in terms of modern day cities and towns, or better yet longitude and latitude data for the frontier? From the point defined above to a point to be fixed on the ground about 2 kilometres east of Lorzendorf: the frontier as it will be fixed in accordance with Article 88 of the present Treaty; thence in a northerly direction to the point where the administrative boundary of Posnania crosses the river Bartsch: a line to be fixed on the ground leaving the following places in Poland: Skorischau, Reichthal, Trembatschau, Kunzendorf, Schleise, Gross Koscl, Schreibersdorf, Rippin, Furstlich-Niefken, Pawelau, Tscheschen, Konradau, Johallnisdorf, Modzenowe, Bogdaj, and in Germany: Lorzendorf, Kaulwitz, Glausche, Dalbersdorf, Reesewitz, Stradam, Gross Wartenberg, Kraschen, Neu Mittelwalde, Domaslawitz, Wedelsdorf, Tscheschen Hammer; thence the administrative boundary of Posnania northwestwards to the point where it cuts the Rawitsch-Herrnstadt railway; thence to the point where the administrative boundary of Posnania cuts the Reisen-Tschirnau road: a line to be fixed on the ground passing west of Triebusch and Gabel and east of Saborwitz; thence the administrative boundary of Posnania to its junction with the eastern administrative boundary of the Kreis of Fraustadt; thence in a north-westerly direction to a point to be chosen on the road between the villages of Unruhstadt and Kopnitz: a line to be fixed on the ground passing west of Geyersdorf, Brenno, Fehlen, Altkloster, Klebel, and east of Ulbersdorf, Buchwald, Ilgen,Weine, Lupitze, Schwenten: thence in a northerly direction to the northernmost point of Lake Chlop: a line to be fixed on the ground following the median line of the lakes; the town and the station of Bentschen however (including the junction of the lines Schwiebus-Bentschen and Zullichau-Bentschen) remaining in Polish territory; thence in a north-easterly direction to the point of junction of the boundaries of the Kreise of Schwerin, Birnbaum, and Meseritz: a line to be fixed on the ground passing east of Betsche; thence in a northerly direction the boundary separating the Kreise of Schwerin and Birnbaum, then in an easterly direction the northern boundary of Posnania to the point where it cuts the river Netze; thence upstream to its confluence with the Kaddow: the course of the Netze; thence upstream to a point to be chosen about 6 kilometres southeast of Schneidemuhl: the course of the Kuddow; thence north-eastwards to the most southern point of the reentant of the northern boundary of Posnania about 5 kilometres west of Stahren: a line to be fixed on the ground leaving the SchneidemuhlKonitz railway in this area entirely in German territory; thence the boundary of Posnania north-eastwards to the point of the salient it makes about 15 kilometres east of Flatow; thence north-eastwards to the point where the river Kamionka meets the southern boundary of the Kreis of Konitz about 3 kilometres north-east of Grunau: a line to be fixed on the ground leaving the following places to Poland: Jasdrowo, Gr. Lutau, Kl. Lutau, Wittkau, and to Germany: Gr. Butzig, Cziskowo, Battrow, Bock, Grunau; thence in a northerly direction the boundary between the Kreise of Konitz and Schlochau to the point where this boundary cuts the river Brahe; thence to a point on the boundary of Pomerania 15 kilometres east of Rummelsburg: a line to be fixed on the ground leaving the following places in Poland: Konarzin, Kelpin, Adl. Briesen, and in Germany: Sampohl, Neuguth, Steinfort, Gr . Peterkau; then the boundary of Pomerania in an easterly direction to its junction with the boundary between the Kreise of Konitz and Schlochau; thence northwards the boundary between Pomerania and West Prussia to the point on the river Rheda about 3 kilometres northwest of Gohra where that river is joined by a tributary from the north-west; thence to a point to be selected in the bend of the Piasnitz river about 1 1/2 kilometres north-west of Warschkau: a line to be fixed on the ground; thence this river downstream, then the median line of Lake Zarnowitz, then the old boundary of West Prussia to the Baltic Sea. As you see the border is only defined approximately with an accuracy about a km or so, but that should be good enough for most mapping exercises. Another good resource is Wikipedia, which also points out a minor change in 1921. The map in canadiancreed's answer is a map of Poland between Brest-Litovsk and Versalles treaties in 1918 (treaties ending WWI) and treaty of Riga in 1920 (treaty after the war between Soviet Russia nad Poland). Poles managed to defeat soviets in 1920 (see Warsaw battle, or miracle at Vistula), and expanded their territory with what is now Western Ukraine and Western Belarus. Unfortunately I don't have a resource that would have lat/long for the Polish borders pre-wwii, but I did find a detailed map that shows multiple towns that could help map to their present day locations. It's for Poland and the Baltics, but it does seem to have decent detail along the Polish/German border. Let me know if this helps at all. Disclaimer: There was two borders, one with East Prussia, and one with Germany proper. I'll describe border between Poland and East prussia going westward from Lithuania towards Dantzig; then I'll describe border between Poland and mainland Germany going southward from Dantzig down to Czechoslovakia. My sources are German maps published between 1926 and 1944, which are avialble on http://www.oldmapsonline.org and on Günter Mielczarek's website. Unfortunately maps published during the war declassed and in some cases even removed the border, so it is harder to spot - in some cases such late maps are unfortunately the only ones available; so we have to deal with that. I try to use both german and polish names when naming place, always using the modern polish name first, then a '/' symbol followed by the german name. Sometimes, nazis changed place names which sounded too slavic, in some cases I could use nazi placenames by error, since I cannot look up the history of every single village. If this happens I apoligize in advance to not use the "proper" (original) German name. Many polish placenames were changed or had their spelling affected as well, I try to use the modern polish names in all cases. In cases where the German name is extremely similar to the Polish name (like if only the spelling changed to reflect the same pronunciation) I left the German names out. The border changed several times "between world wars", in particular, Upper Silesia remained entierely German until relatively late. We of course describe them once they have stabilized. gmn. = Gmina, the 3rd level administrative division of modern Poland, equivalent to a municipality. In rural areas it's not rare to have a dozen of places in the same Gmina for administrative purposes. When I mention a "modern" or "contemporary" border this stands for 2017. Unforutnately gmn. and pow. borders have been subject to constant change and are still subject to furure changes, so I try to describe the border as well as I can, resorting to equivalent with modern border only to help. In some cases (large towns), a gmina is also a powiat; in our case this only is a source of confusion in Silesia were the border passed through urban areas. When I mention "the border" without specifying, I am always implicitely refering to the border between Germany and Poland between 1925 and 1939. Sometimes this border coincides with modern woj. borders, somtimes only with modern pow. or gmn. borders, and sometimes with no administrative border at all. This is because most gminas in Poland were merged to forme larger Gminas of up to dozens of villages, making many borders dispearing. Even if they didn't disapear in some cases the modern gmina border does not always match with the old ones. There were some major changes in some places, when there was so much change that the area is hard to reconize I mention it. In some cases entiere villages were destroyed and not rebuild, in other cases new places were made which didn't exist at all at the time. This is still relatively rare, fortunately, and the majority of the times the landscape is recognizable. The border started at the former German-Lithuania-Poland tripoint, which corresponds to the modern quadripoint between Warmian-Masurian voivodeship (D), Podlaskie voivodeship (P), Lithuania and Kaliningrad oblast exclave from Russia (D). The border followed mostly the modern border between Warmian-Masurian voivodeship and Podlaskie voivodeship. The only difference seems to be Bogusze (P), today in Warmia-Masurian voivodship. After reaching the modern tripoint between Warmian-Masurian, Mazovian and Podlaskie voivodeships, the border continued along the modern woj. border between Mazovia (P) and Warmia-Masuria (D); but with a few more changes. The 3 villages of Dabrowy (P), Dabrowy-Dzialy (P) and Antonia (P) are today in Warmian-Masurian voivodeship. The border south of the village of Wujaki/Wujaken (D) was straight and didn't have this extra area it has today. When joining the Omulew river, the border did not turn north to follow the river like it does today, but went straight across the river, meanings the villages of Mącice (D), Ścienciel (D), Kolonia Ścienciel (D) and Opaleniec (D) were part of Germany, even though today they are today part of Mazovia voivodship. The border then followed the Orzyc river. Near the village of Szczepkowo-Giewarty, the border leaved the river for the north, going I think in the middle of this village. It continued west, following the contemporary northern gmn. border of Janowiec Kościelny. The villages of Zabłocie Kanigowskie/Winrichsrode, Safronka/Safronken, Wiłunie, Powierz, Grabowo Leśne and Napierki/Wetzhausen (D), which are today part of this gmina, were however part of Germany. After Napierki the former border follows the modern pow. border between Działdowski (P) and Nidzicki (D) powiats, until it went between Gołębiewo/Taubendorf (D) and Wilamowo/Wilmsdorf (P). At this point, the border leaved the modern pow. border and went to the northwest. The border went between Sławkowo (D) and Kramarzewo (P), then north of Uzdowo (P), until it reach the Wel river, and surounded the village of Wądzyn/Wansen (D). The border rejoined the modern pow. border between Ostródziki (D) and Działdowski (P) powiats, between Groszki (P) and Odmy (D). The border continued among the modern pow. border between Ostródziki and Iławski powiats, between Elgnowo/Elgenau (D) and Guttowo (P). The border followed a river which appears to be unnamed. It went between Gierłoż (D) and Gierłoż Polska (P) (hence the name!). The border left the modern pow. border and followed the Drwęca river towards the south, and passed just north of Rodzone (P). The border leaved the river and passed just north of Pustki (P), and followed the modern pow. border between pow. Nowomiejski (P) and pow. Iławski (D). It bordered lake Radomno, leaving the lake entierely in Poland. The border coincides with the modern pow. border until the point where Osa River goes into lake Osa. At which points it goes just east of Czachówki/Schackenhof (P), and pass between Biskupiec/Bischofweder (D) and Fitowo (P). The border followed the river for a while, and eventually had a strange shape, following the gmn. border between Podlasek (D) and Babalice (P) gminas, then the gmn. border between Podlasek (D) and Osówko (P). The border went then between Wałdowo (D) and Wielka Tymawia (P). Krzywa (P) was in Poland, and the lake of Goryń in Germany. The border finally rejoined modern woj. border between Warmia-Masurian and Pomeranian voivodships. The border started at the Baltic Sea west of the village Dębki/Dembeck (P). It followed the Piaśnica river, and followed the shore of the lake Źarnowiec, leaving it in Poland. The village Nadole (P) was almost a Polish exclave - the road leading to this village from the north, by the lake's shore, was in Poland but the field imediately west of the road were already in Germany. (Looking at a modern map, it seems like this road had stopped to exist since - or became a simple footpath). The village of Czymanowo/Rauchensdorf (D) was in Germany but the entiere lakeshore was in Poland. Apparently the border was created so that it was possible to reach Nadole also from the south without leaving Poland, the road itself being the border. Today an electricity plant was created, the road doesn't exist anymore because water rose, and the area has changed so much it's hard to tell exactly where the border was. The border continued to follow the Piaśnica river, corresponding to modern border between pow. Pucki and pow. Wejherowski, between Tyłowo/Tillau (P) and Opalino/Oppalin (D). The border passed just south of Warszkowo/Warschkau (P), Kniewo/Kniewenbruch (D) was in Germany. At this point the map is very unreadable and the border unclear, but my understanding is that the border followed the Reda river, cutting the hamlet of Zamostne/Überbück in two. At which point it followed the modern gmn. border between Gniewino (D) and Luzino (P) gminas for a short while, following the Reda, but turning to a minor river, then leaving the current gmn. border to pass between of Zelewo/Seelau (P) and Zielnowo/Sellnow (D). The border went straight south passing between Strzebielino/Strebielin (P) and big/little Bożepole/Boschpol (both in D). The border passed just east of Paraszyno (D) following a pattern close to the modern gmn. border, and on its south reached the Łęba river until a bit south of Osiek (D), then turned straight to the west, passing north of Tłuczewo(P). The border then went north between Osiek (D) and Kętrzyno/Kantschin (P), and then south again between Kętrzyno (P) and Dzięcielec/Spechtshagen (D), following the modern gmn. border. The border followed the modern pow. border between powiat Lęborski (D) and powiat Wejherowski (P) southwestwards. When passing near Kamienicki Młyn/Kaminizamühl (P) the border continues east along the modern pow. border between Lęborski (D) and Kartuski (P) powiats, passing through 2 lakes and following the Bukowina river, it continued to follow this border towards the south after it leaves the river, leaving Siemirowice/Schimmerwitz (D) in Germany. On the north of Smolnicki (P), the border followed the modern pow. border between Bytowski (D) and Kartuski (P) powiats. The border leaves the modern pow. border to follow the Obrowa river, passing between Bawernica (P) and Nowa Wieś (D), and between Baranowo (D) and Chośnica (P). The border went south and rejoins Słupia river, and went through lake Żukowski/Treuenfelder See. It goes between the village of Żukowko/Treuenfeld (D) and Jamno (P). It continued going between Gołczewo/Golzau (P) and Jeleńcz/Hirschfelde (D), cutting lake Stropno in half. The border followed the western shore of Glinow lake for it's north half, and then went east straight through the lake, making the northern lake Polish and it's southern half German; went between Półczno/Kniprode (D), Nakla/Nackel (P); The border passed west of Skwierawy (P). The border then followed the modern pow. border between Bytowski (D) and Kościerski (P) powiats, and then the pow. border between Bytowkski (D) and Chojnicki (P) powiats, leaving Sominy (D) in Germany and both big and small lakes Sominy are split between both countries. The border went to the west, passing north of Prądzonka which was in Poland, cutting the "small lake" in two halves (modern border between gmina Studzienice and Lipnica). It then followed the border between gmina Lipnica (Poland) and Tuchomie (Germany), and continued to follow border of gmn. Lipnica, passing through Lake Kamieniczno, then north of Łąkie/Lonken. Southwest of Piaszczyna/Reinwasser, the border continues along the modern pow. border between Bytowski (D) and Chojnicki (P) powiats; and then the between Człuchowski (D) and Chojnicki (P) powiats, passing between Garbek/Neuhof (D) and Życe/Sichts (P), and then passing just west of Konarzyny (P), then between Nieżywięc/Niesewanz (D) and Topole (P). The border then followed the modern woj. border between West Pomeranian (D) and Greater Poland (P) voivodships. It followed the river Łobżonka, eventually leaving the woj. boder to follow the pow. border between Pilski (P) and Złotowski (D) powiats; passing just east of Ronda/Ruden (D). It left this border when approaching the village Maryniec (P), the border went north of the current border, passing just south of the Głubczyn/Steinauer lakes (D); then the border passed just on the easter shore of the Wapień lake, but went through the lake and rejoined the modern pow. border. The border also crossed a small lake north of the Black Lake (north of Jeziorki/Stüsselsdorf (P)) which seems to have disapeared since. The border followed the modern gmn. border between Piła and Kaczory gminas and reached the Giwda river, it passed just north of Ujście (P), then followed the Noteć/Netze river. The border passed just east of Czarnków/Scharnkau (P), and then just north of Wieleń/Filehne (P), passed betwen Krzyż/Kreuz (D) and Drawsko/Dratzig (P), at which point it left the Noteć/Netze river, and followed a canal which seems to no longer exist, cutting the village of Chełst/Neuteich in to halves (west Chełst (D) and east Chełst (P)), and passed west of Kamiennik/Kaminchen (P). South of which, the border follows the modern woj. border between Lubusz and Great Poland. The 3 villages of Stoki, Świechocin and Silna (P) were already part of Poland, even though they today are in Lubusz voivodship, the border rejoins the modern woj. border just west of Silna (P). The village of Nowa Wieś/Schloss Neudorf (D) was part of Germany, even though it is today part of Greater Poland voivodship (the border surrounded the village in a square shape). (Its twin village of nowa Wieś Zbąska/Neudorf (P) was already part of Poland). The village of Wialka Wieś/Grossdorf (D) was part of Germany, even though today it is part of Greater Poland Voivodship. The group of three villges of Świętno, Rudno and Wilcze (D) were part of Germany, even though today they are part of Greater Poland voivodship. The border then follows the woj. border between Lubusz and Greater Poland, and then the woj. border between Lower Silesian and Greater Poland. The border passes just west of Trzebosz/Triebusch (P), the villages of Zaborowice, Parłowice, Giżyn, Czechnów, Sułów Mały (D) were part of Germany even though today they are part of Greater Poland voivodship. The villages of Niwki Książęce (P), today part of Lower Silesian Voivodship, was part of Poland, (the Młyńska Woda river was the border east of Niwki Kraszowskie/Landeshalt). The border followed the woj. border between Opole (D) and Łódź (P) voivodships, exept around of Praszka (P), where the Prosna river was used as a border, leaving a large region of approx 20 villages which were part of Poland in Opole voivodship. The border followed the modern gmn. border between Rudniki (P) and Radłów (D) gminas, and rejoined the modern woj. border between Opole (D) and Upper Silesia (P) voivodships southwest of Bobrowa (P). The border followed the Liswarta river, leaving the modern woj. border west of Stany (P), continuing among the river, on the modern pow- border between Lubliniecki (D) and Kłobucki (P) powiats. South of village Kamińsko (P), the border leaved the river and passed south of Zborowiskie/Ostenwalde (D), then between Ciasna/Teichwalde (D) and Glinica/Glinitz (P), then west of Łagiewniki Wielkie/Gros Lagiewnik (P) and east of Skrzydłowice/Flügeldorf (D), then west of Pawonków/Pawonkau (P). It rejoined the modern woj. border west of Koszwice. The border then followed the modern pow. border between Targnogórski (D) and Lubliniecki (P) powiats, then followed the Mała Panew river for a while, until reaching Mikołeska (P), where the border passed west of the village. The border passed between Boruszowice (P) and Hanusek (D), between Kopanina (D) and Rybna (P), east of Laryszów/Larischhof (D), between Ptakowice/Ptakowitz (D) and Repty Stare/Alt Repten (P). It passed shouth of Nowy Radzionków/Neu Radzionkau (P) following the Szarlejka river, then went all arround the city of Bytom/Beuthen (D), leaving the entiere sub-urban villages in Poland. It then followed the Bytomka river, passing between Bobrek (D) and Orzegów (P). Rudzka Kuźnica/Ruda Hammer (P) was part of Poland even though it's on the german side of the river, the former border following the modern gmn. border between Ruda and Zaborze. The border then went west following the Czarnawka river, north of Pawłów/Paulsdorf (P), followed the modern Makoszowy border to the southwest, then followed the train tracks to the northwest (leaving the industrial complex here in Germany), then followed the Czarnawka river again. When this rivers joins the Kłodnica, it went straigth south where there is today a very complex Highway cossing and followed the adequately named "Graniczna" road, following the modern pow. border between Gliwicki (P) and Gliwice (D) powiats. The border went just west of Krywałd (P), and passed northwest of Wilcza (P), eventually rejoining the modern pow. border between Rybnik (P) and Gliwicki (D) powiats. At this point, a lake which didn't exist was created so it's hard to compare modern and previous topoloy, apparently some villages were flooded ! The border passed north of Zwonowice (P) and followed the modern pow. border between Raciborski (D) and Lyski (P) gminas, it passed between Bogunice (P) and Górki/Waldeck (D), and continued to follow this powiat border toward the south. The border then follows modern gmn. border between Racibórz and Kornowac gminas toward the southwest, and leaved this border to pass just north of Dębicz/Dembitsch (P), then followed the Ulga to the south (back then it weren't canalized so it made a lot of turns, today the canal is straigth). Eventually the border joined the Odra river. The border follows the Odra southeastwards until the former Czechoslowak/German/Polish tripoint, which was just east of Olza/Olsau (P). Today this is the tripoint between powiat wodzisławski, powiat Raciborski and Czech republic. A large part of this voivodship was part of the Free City of Danzig/Gdańsk (not just the city itself but also surronding countryside), not really part of Germany but it was a mostly German state nevertheless. Powiat Czarnkowsko-Trzcianecki : Northern half (north of Gwada river); A strip of land including western half of Chełst, Pełcua and Kawczyn. As a side note, I'd point out that Bogatynia region is the only former German terriotiry of Poland which was not Prussia, but Saxony. 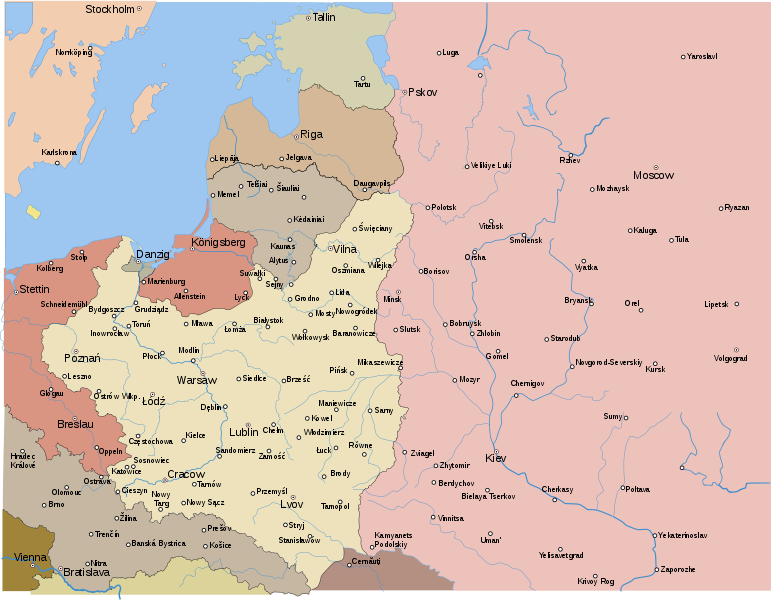 In order to understand the pre-war Polish-German boundary, it is worth noting that six (or five and a half) provinces were taken from Germany and given to Poland after the war. These provinces included Silesia, Opole, Lower Silesia, and Lubuscz in the west. That is, their EASTERN boundaries had formed the German-Polish boundary before the war (as part of Germany), while their WESTERN boundaries formed the German-Polish boundary after the war (as part of Poland). The other two formerly German provinces were Pomerania, and West Pomeria. 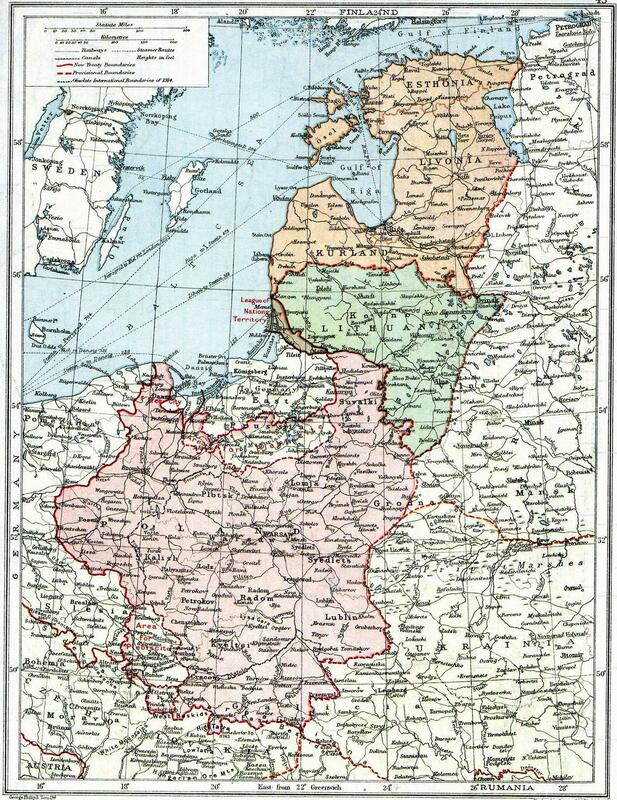 Pomerania was the southern half of the former German East Prussia, and its eastern boundary formed the dividing line with Prussia (Germany) to the WEST and Poland to the East. MOST of the former Western Pomerania belonged to Germany before the war (except for a 60-mile wide "Polish Corridor" to Gdynia, to give that country an outlet to the sea). ALL of it now belongs to Poland. Not the answer you're looking for? Browse other questions tagged 20th-century world-war-two germany poland geography or ask your own question.